Wix vs WordPress: Which One To Choose To Build A Great Website? Which One You Should Choose To Build A Website: Wix vs WordPress! Techtiq Admin	 November 14, 2018	 Leave a Comment on Which One You Should Choose To Build A Website: Wix vs WordPress! Choosing between Wix and WordPress is not such a simple task. Both have their Pros and Cons. Both Wix and WordPress can develop an elegant website. When you are building your website, you need to be sure that you have selected the right platform. The last thing you require to do is to be shocked that the platform you chose won’t do what you want it to. In this article, we will make a straight comparison of WordPress and Wix and also give you the information you require to decide which one you should choose to build a website. Let’s Check What Wix and WordPress are? At the core, both are website builders. You can build and manage excellent websites that exist to today’s design standards in many matters and enterprises. Both hold unique abilities for SEO and protection. For building pages and blog posts, both are considered great. Although let’s take a look in detail. WordPress is the most traditional CMS- content management system on the earth. It’s built with PHP and practices MySQL for its databases. It can also manage HTML and CSS. It provides it with plenty of benefits. Wix is a free and easy to handle online website developer that allows you to develop HTML5 sites with the help of drag and drop tools. Think about specific questions to understand which makes the most sense to you. Whether it’s you offering services or getting an affiliate revenue. That doesn’t matter, do you want to make money? Are you worried that the learning curve for any technology may be too much, and you expect you can get something easy to handle? Are funds insufficient to began so you wish you can start with something free? Thus, note your answers because further will cover the difference between both the platforms. Your answers will assist you in deciding which platform can work best for your website. While the article is all about WordPress vs Wix, both are the most traditional platforms for go-getting bloggers. As Wix is the one platform that is demanded the most. Wix is easy and simple to handle that is a huge positive point for everyone desiring to launch a website. Massively marketed, follow a few Youtube videos after searching for “how to start a blog” and you will get to know everything I mean, they do make the thought of producing their own website a simplistic way. While Wix does have a few features that make it very easy to begin. I have listened from many folks that as soon as they desire to do something new, they hit with another fee, and those expenses can add up speedily. Wix provides a basic website developer for free. However, there are two significant downsides to it. First, it puts Wix branded ads on the top and bottom of your site. Second, you are unable to use a custom domain name for your website. Therefore your site address will look like: username.wix.com/sitename. To stop or remove ads and get extra features, you need to upgrade to one of the premium plans they offer. All Wix premium plan has various storage and bandwidth limitations. You can also pay monthly or take a yearly plan as per your need. It’s open source and loaded with multiple choices. You own everything with it. The perspective of the article is pointing up to my opinion on WordPress, but before we go further, I want to make sure that you are aware of we talking on the self-hosted version of WordPress. Now, it’s time to look back to the questions I asked above, do you desire to make money? Do you want to earn affiliate revenue? If yes, then I could conclude this article here and wrap it up. The WordPress software is accessible for free for all to use. If you wish to monetize your website, then you need to have the self-hosted version of WordPress. Not only is WordPress on amicable terms with Google, no matter what you visualise to do with your website you can efficiently fulfil it with WordPress. Relying on your funds, you can begin with a basic plan with a WordPress hosting providers. 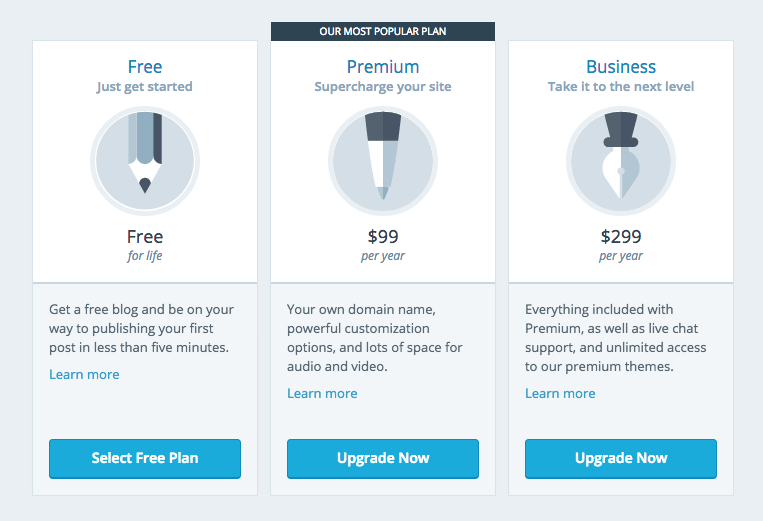 The cost of a WordPress site can grow if you choose to use premium plugins. However, there are numerous WordPress themes and plugins available free that you can practice to diminish costs. You can also add several features to your WordPress site applying a plugin without upgrading your hosting plan. Both platforms allow you get started instantly and develop something exceptional. Both have a broad spectrum of prices, and also both have plenty of features to produce a lot of sites. Choosing the best is something you have to determine for yourself. What’s best for you might not be what’s best for me, No matters. WordPress is excellent for flexibility and expandability. Whereas, Wix is great for simplicity. Both platforms have constraints, but each offers something different for the new website development company owner. I hope this article served you compare Wix vs WordPress. Choosing which one is best for your website is a big decision. Now it’s your turn. Have you practised on both platforms? Or Do you have something to add? I would like to hear it drop a comment below! Previous PostHow to Choose the Best E-Commerce Web Development Platforms! Next PostImportant Steps For Successful Mobile App Testing!